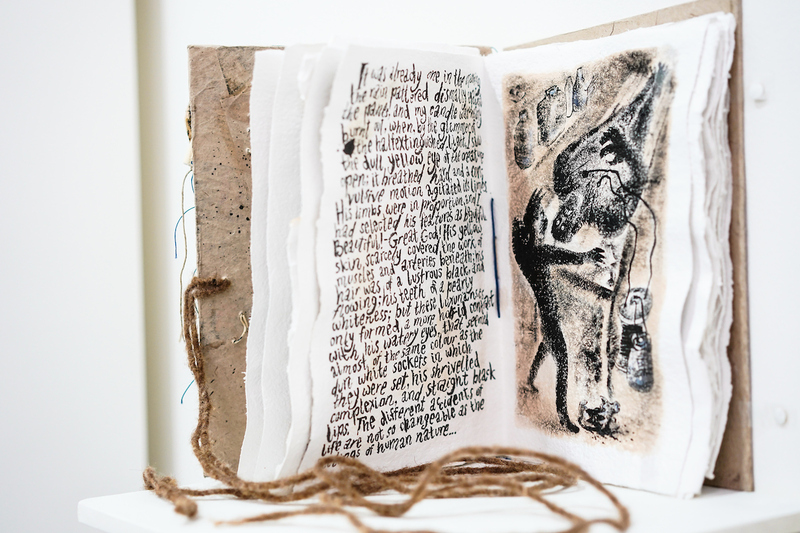 Kirkby Gallery is currently hosing an exhibition of book art related to Mary Shelley’s legendary novel Frankenstein; or, The Modern Prometheus. ‘Book Art’ involves using books as the basis for a piece of art – it could be a sculpture made out of a book, or a piece of art inspired by the structural or conceptual properties of books. All the exhibits in the show are a different take on the same theme, but there are some very different interpretations! The book art on display in Kirkby has been created by local, national and international artists to celebrate 200 years since the release of Frankenstein, the classic gothic text that was arguably the earliest work of science fiction. Artists involved in the exhibition have been inspired by the way the story is told in their art and others have made links with other classic gothic stories such as Dracula and The Golem. Some of the important themes seen in the book including ambition, free will, morality, ethics and empathy can also been seen in the art. A smaller version of the Frankenstein Book Art exhibition opened in Liverpool Central Library earlier this year, but visitors will be treated to lots of new exhibits at Kirkby Gallery – with an extra 25 original pieces that were not displayed in Liverpool. Some of the pieces you will see are unique and luckily for arty gothic fiction fans, many are available to buy and own – but all are guaranteed to get you thinking! And, with a workshop space at the centre of the exhibition, if you are inspired to try creating your own Book Art, you’ll find all the materials you need – and all are welcome to have a go, from the youngest to the oldest of visitors. There are also lots of books dedicated to the theme of Book Art if you are a creative person looking for inspiration and advice. School or educational groups are welcome – contact the gallery to arrange a visit. The Liverpool & Knowsley Book Art exhibition: Frankenstein 2018 is open in Kirkby Gallery until 26 January 2019. Kirkby Gallery is open Monday to Friday from 9am – 5pm. On Saturdays it is open 10am – 1pm. You will find it on the first floor of The Kirkby Centre, Norwich Way, Kirkby, Knowsley, L32 8XY.